Primary school students in rural Australia are using Google Classroom to collaborate with astronauts on the Space Station. A school without any IT support in Mexico was able to go paperless with Classroom. And in the United Kingdom, a Holton, Oxfordshire school is exploring local historical villages and writing reports using Google Apps and Classroom. 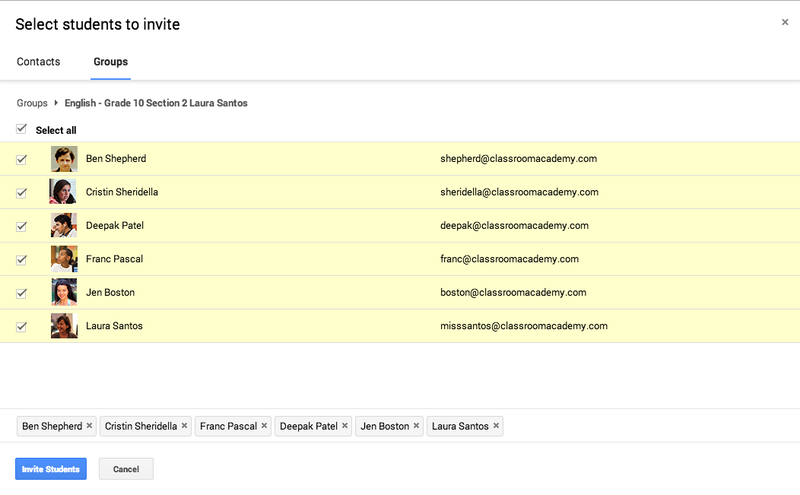 If you already have a Google Group set up for your class, you can now use that group to invite students to Classroom. And if your school uses tools like School Directory Sync, your Google Apps administrator can sync your school’s class rosters from your student information system (SIS) into Google Groups, helping you use these groups to set up a class in seconds. Not all assignments require students to submit work online — like reading a chapter or conducting an experiment — so we’ve added the ability for students to simply mark assignments as "done" if there's nothing to turn in. We’ve also given the Assignments page a refresh, to make it easier for students to keep track of upcoming work. We’re also giving teachers greater control over their class stream. Teachers can now set permissions for whether or not their class can post or comment in the stream, they can mute individual students from posting or commenting and can even view previously deleted items in the stream. Teachers will now have the ability to download grades for all assignments at once, making it easier to export assignments to any gradebook. And now teachers can also choose to sort students by first or last name, depending on their needs. We hope that these updates make Classroom even more efficient and effective to use with your students. We'll be making regular updates throughout the year, so keep submitting feedback and stay tuned.